Mongolia has a rich shamanic history. Under Russian influence throughout the 20th century, shamanism became illegal and was forced underground. Despite the external pressure to eradicate the practice, shamans continued their craft until Mongolia gained its independence in 1990. Since then, there has been a revival of shamanic activity throughout the country. People are finding that these ancient rituals and practices, still intact from the ancestral past, are effective tools for navigating the multidimensional landscape of their contemporary world. They navigate politics, economic disparity and hardship. They investigate and uncover forgotten histories, reawakening their ancestral connections. This allows them to find meaning -- to literally re-member themselves, their people, the spirits of the land. This speaks to a key component of shamanic practice: the ability to create a world filled with meaning, depth and connection. This helps to fill gaps that remain in a scattered cultural, spiritual and social arena, one that actively sought the dissolution of shamanism and by extension, a way of life. For Mongolian anthropologist Manduhai Buyandelger, this was not only a story close to home but a story to tell. In her account Tragic Spirits, she traces the evolution and implications of this newfound growth and interest in Mongolian shamanism. Have you ever wondered why in modern Christmas tradition we do the things we do? What is the origin of the Christmas tree, with the star on top, decorations about, and all the brightly wrapped presents beneath? Or the idea behind Santa Claus who jets around the globe in a magic sleigh with flying reindeer – defying both time and space – to deliver the world’s children a bounty of Christmas gifts? And since when did Santa and the birth of Jesus have anything to do with each other? Where do these stories come from – and better yet: what are we actually celebrating on Christmas morning? There are answers to these questions. And the history is not so farfetched or even that hidden. You just have to know where to look. And the first place we look is the North Pole; seriously – in ancient Siberia, near the top of the world. The story of Santa and his likely origins begins where he supposedly lives: the frigid North. In this wintry-wonderland, if you go searching for Santa, you may not find him or his Elvin factory – but you will find groups of indigenous people native to what we know as Siberia. Among these cultures are the northern Tungusic people, known as the Evenki. The Evenki were predominantly hunter-gatherers as well as reindeer herders. Their survival depended largely upon the health and vitality of their domesticated reindeer. The reindeer provided the Evenki and other northern tribes with everything from clothing, housing material, wares and tools from the bones and antlers, transportation (yes, they ride reindeer! ), milk, as well as cultural and religious inspiration. The Evenki were also a shamanic culture. The word “shaman” actually has its roots in the Tungus word saman which means “one who knows or knows the spirits.” Many of the classic shamanic characteristics that would later be reflected in cultures all over the world were originally documented by Russian and European explorers while observing the Tungus and related people’s religious life. This includes the three-world system, the shamanic journey or soul flight, the use of altered states of consciousness, animistic belief in spirit, and so forth. A significant aspect of the shamanism practiced in this part of the world during that time was linked to Amanita muscaria, also known as the Fly Agaric mushroom. This mushroom is more widely accepted in the modern world as the Alice in Wonderland mushroom. It was held very sacred by these ancient people, and was used by the shaman and others for ceremonial and spiritual purposes. Amanitas – as you can tell by the pictures – range from brightly red and white to golden orange and yellow. They only grow beneath certain types of evergreen trees. They form a symbiotic relationship with the roots of the tree, the exchange of which allows them to grow. One of the reported ancient beliefs was that the mushroom was actually the fruit of the tree. Due to the lack of seed, it is also commonly held that Fly Agaric was divine – a kind of virginally birthed sacred plant. Although intensely psychoactive, Amanitas are also toxic. One way to reduce the toxicity and increase the psychoactive potency was to simply dry them. When out collecting the mushrooms, people would pick a bunch of them under the evergreen trees and lay them out along the branches while continuing to pick the mushrooms beneath other trees. The result was something that looked very reminiscent of a modern Christmas tree: evergreen trees whose branches are dotted with bright red, roundish “decorations” – in this case the sacred mushrooms. At the end of the session, the shaman or harvester would go around to each of their mushroom stashes and put them all in one large sack… a large sack?!! Remind you of anything?! Not only this, as the story of the tradition goes, the shaman would then, carrying this large sack, visit the homes of his or her people and deliver the mushrooms to them. They would then continue the drying process by hanging them in a sock, near the fire! 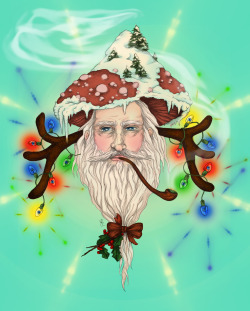 However it may have happened in antiquity, the connection between the reindeer, the mushroom and the shamanism is apparent. A very common vision that one has while under the influence of Fly Agaric is precisely that: flying. Massive distortions of time and space occur, affecting scale in dramatic ways. Not only do you observe yourself flying, but also other things… like reindeer. It is not that difficult to connect the dots here. Shamanic people are deeply invested in their environment. They learn the magical and mystical properties of the natural world, and often assign a great deal of importance and sacredness to the bearers of that magic. For some of these ancient Siberian people, this power was charioted by the reindeer and the sacred mushroom. That the reindeer should have the ability to fly is evident not only in the vision, or their clearly altered state once intoxicated, but also in the wisdom they offered to the shamans by eating the mushroom in the first place, and for guiding them to do so just the same. It wasn’t only the reindeer who could fly, but the shamans also took flight. As mentioned, the shamanic journey or soul flight is a keystone in shamanic practice and especially so in ancient Siberian culture. In order to interact with the spirits, the shaman had to be able to leave this world and enter theirs. This was accomplished by projecting his or her spirit from the physical and into the immaterial. They either needed the power to do this on their own, or use a spirit helper to take them. It is very common for shamans to develop relationships with birds, naturally, as they have the power to fly. But here, in the North Pole, what better animal to use than the magical, flying reindeer? Shamanism is often considered one of the oldest forms of spirituality in the world. The word 'shaman' comes from the Turkic šamán, referring to a kind of indigenous Siberian religious (or spiritual) specialist. Practices akin to those observed in ancient Siberia have been documented and experienced in many (if not most) cultures around the world, contemporary and ancient. Because of these perceived similarities, the word 'shaman' has become an umbrella term that signifies a host of religious specialists and spiritual practitioners worldwide. In traditional societies the role of the shaman was multifaceted. Commonly recognized as persons of knowledge, the shaman held the simultaneous role of healer, spiritual guide, diviner, and ritual specialist. Classically viewed as a mediator between worlds, the shaman sought and received guidance and knowledge from the spirit realm in order to solve problems and overcome conflicts found within human society. One of the hallmark features of a shamanic practitioner is their ability to enter specific altered states of consciousness with the intent to access the spirit world and successfully return with whatever it was they were seeking -- a healing method, a solution to a problem, knowledge, the whereabouts of something, a song, the answer to a question, guidance, etc. Nevertheless, and despite the negative or inferior view held in common of shamanism and shamanic cultures (and perhaps because of it), the shaman has loomed large in the Western psyche from its inception. Starting in the mid 20th century and continuing into the contemporary cultural-spiritual landscape, shamanism is now viewed as a key element relating something vital that Western culture lost and would benefit tremendously from getting back. The view of shamans as backward, crazy, and irrelevant people living in a nostalgic past gives way to an understanding that holds shamans and their traditions in high esteem. Shamans and shamanic cultures are now seen as more spiritually advanced and in touch with nature, their lack of technological amenity a liberating boon rather than impeding obstacle. This perception by Westerners holds to the notion that shamanic cultures embody an archetype of everything that went amiss in the West during its march towards modernization. This has led many people to seek out teachers, traditions, and shamans from indigenous cultures worldwide, from ancient Europe to Siberia to the Americas and beyond, in order to learn and ultimately bring shamanism back to the West. The result is an ever growing and morphing "field" of contemporary shamanism that expresses its influence everywhere from hospitals and among medical professionals, to psychotherapy and mental health clinics; in churches and universities, filling shelves in bookstores and New Age shops; at cultural festivals and expos; and in the homes, offices, and places of interest for many people and practitioners honing a deeper connection to their spirituality and fulfillment in their lives. How this will continue to grow and change is contingent upon and limited only by the hearts, minds, and spirits of this burgeoning shamanic culture in the modern world.